« Bike Month Proclamation April 16 – Be There! Moscow’s Active Living Task Force is recruiting captains to help lead teams of community members on a round-trip walk on Saturday morning, April 21 to evaluate a proposed route for Moscow’s first Neighborhood Greenway. 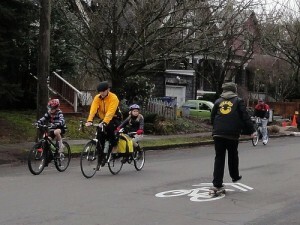 Neighborhood greenways are streets with low traffic volume and speed where bicycles, pedestrians, and neighbors are given priority. Captains need to attend a training session at 4:00pm on April 19th which will included assessing one of the three legs of the proposed routes. If you are interested in being a team captain, please contact Assistant to the City Supervisor Jen Pfiffner by April 17th (jpfiffner@ci.moscow.id.us, 208.883.7123).